People opposing Proposition A listen to a speaker during a rally in Kansas City, Missouri. Missouri voters made history on Tuesday, blocking the state’s Republican lawmakers from enacting right-to-work laws to cripple labor unions. 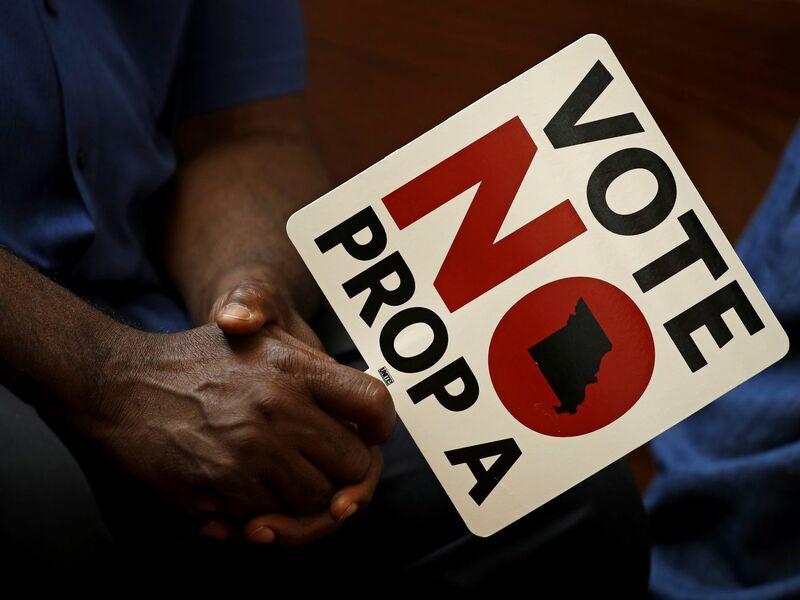 The state’s primary voters rejected Proposition A, which would have made it illegal for unions to charge fees to workers they represent who don’t want to pay them, by a two-to-one margin when the vote was called by Decision Deskaround 10 pm Eastern. Missouri was on track to become the 28th state to enact such a law. Last year, the state’s then-governor, Republican Eric Greitens, signed the right-to-work bill, saying that it would encourage businesses to move to the state. Missouri would have followed Michigan, Wisconsin, and other Rust Belt states that have passed similar anti-union measures in recent years under pressure from business groups. But workers and union leaders in Missouri put up a fight. They gathered about 300,000 signatures — more than double the number needed — to freeze the law and put it on the ballot for voters to decide. On Tuesday, voters rejected the bill. Tuesday’s election marks the first time voters have overturned a right-to-work law through a ballot referendum since Ohio did something similar in 2011. No other state has even tried to in recent years. It’s also a major victory for the US labor movement at a time when Republican leaders, big businesses, and the courts have doubled down on their attempts to weaken the influence of labor unions and the workers they represent. And after the US Supreme Court’s June ruling in Janus v. AFSCME, which mandated right-to-work rules for all government unions, Missouri’s vote is a sign that unions are far from dead. They might even see a revival. In states without right-to-work laws, employees at unionized workplaces don’t have to pay union dues, but they do have to pay “agency fees.” These fees are lower than the dues members pay, but they cover the union’s cost of negotiating employment contracts that benefit all workers. Right-to-work laws make it illegal for a union to charge those fees, which can strain its finances and give workers an incentive not to pay dues. This is known as the “free rider” problem, in which some workers benefit from union contracts but choose not to pay for it. That’s what Missouri politicians wanted. But workers and unions in Missouri have fought back. They built a massive campaign to defeat the Republican law, gathering 300,000 signatures to put the referendum on the ballot. Construction workers, ironworkers, and steelworkers knocked on about half a million doors to mobilize voters to the polls, according to the AFL-CIO, the nation’s largest federation of unions. A union-backed group raised $15 million for the effort — more than five times the amount of money raised by two business groups supporting the right-to-work bill. Labor groups had framed the issue as a fight between workers and greedy billionaires. The campaign even enlisted actor John Goodman, a Missouri native, for a 30-second radio ad. That message has resonated with unionized workers across the country, whose wages remain flat as CEOs earn record-high salaries and corporations reap massive tax cuts. Teachers across the country have led the revolt against such pro-business policies that swept through conservative states in the past decade — policies that never led to the promised economic boom. With the support of their labor unions, teachers in states like Arizona, Oklahoma, and West Virginia have forced state lawmakers to raise business taxes to pay better wages. Missouri might be the start of a similar backlash, one targeted toward Republican right-to-work policies that hurt labor unions and the middle-class workers they represent. When Republicans took over a historic number of state legislatures in the 2010 midterms, they focused on two things: cutting taxes and weakening labor unions. With support from pro-business groups, lawmakers began to expand right-to-work laws from the South to Midwestern states with a strong union presence. In 2012, lawmakers in Indiana and Michigan passed these laws. At the time, the country was in the midst of the Great Recession, and politicians promised that relaxing labor laws would attract businesses to the state and turn around the economy. Since then, Wisconsin, Kentucky, and West Virginia have passed right-to-work laws too. Economists have been closely studying the economic impact, and none have found any evidence to back up the claim that right-to-work laws boost the economy. At best, the laws slightly increase the number of businesses in the state, but they don’t really benefit workers. At worst, these laws lower average wages for all workers after they are passed. The latter is the most likely outcome, based on the research. One study conducted by economist Lonnie Stevans at Hofstra University in 2007 found that right-to-work laws did lead to an increase in the number of businesses, but those economic gains mostly went to business owners. Meanwhile, average wages for workers went down. One 2015 study showed that Oklahoma’s right-to-work law didn’t lead to more jobs, but it also didn’t seem to affect wages. The Economic Policy Institute, a left-leaning think tank, attributes right-to-work laws to a 3.1 percent decline in wages for union and nonunion workersafter accounting for differences in cost of living, demographics, and labor market characteristics. Had voters in Missouri approved Proposition A, they would probably see a similar drop in income, according to economists at the University of Missouri Kansas City. In a 2014 study, they concluded that Missouri’s shifting to a right-to-work statewould result in an annual loss of $1,945 to $2,547 per household. It shouldn’t be a surprise that anti-union laws would hurt middle-class families. The decline of labor unions is largely responsible for the growing income inequality in the United States. Back in the 1950s, about one-third of American workers belonged to labor unions. Today, only about one in 10 workers are unionized. This is the culmination of decades of decline in private sector unions in America, caused by a variety of factors including slower employment growth in unionized workplaces (compared to nonunion workplaces); anti-union legislation, particularly in the South and more recently the Midwest; the automation, offshoring, and general decline of union-heavy industries like textiles and auto manufacturing; and more sophisticated corporate anti-union drives. Labor unions were largely credited with helping maintain stable middle-class factory jobs in Rust Belt states like Missouri in the ’50s and ’60s. But the disappearance of manufacturing jobs, plus the aggressive corporate lobbying to weaken labor unions, has been a driving force behind the massive income gap in the United States. In 1965, CEOs earned an average salary that was 20 times higherthan the average worker’s; by 2016, their salaries were 271 times higher. Strong unions have helped reduce inequality, whereas weaker unions have made it easier for CEOs, sometimes working with market forces that they have helped shape, to increase it. The decline in unionization since World War II in the United States has been associated with a pronounced rise in income and wealth inequality. Missouri voters — and workers across the country — have shown that they are ready to reverse that trend.